Or are they? Fact is, Bundestrainer Joachim Löw uses friendly matches to experiment, which means that fans do not always get to see the best that die Mannschaft has to offer. Ahead of last night’s match against Brazil Löw had sent home Thomas Müller and Mesut Özil and also left out Marc-André ter Stegen, who was excellent against Spain. In midfield Ilkay Gündogan got to start ahead of Sami Khedira, Leon Goretzka replaced Mesut Özil, and Leroy Sané replaced Thomas Müller. Up front, Mario Gomez started for Timo Werner. Although on paper all four are excellent replacements, Löw got his selection somewhat wrong. Pairing Gündogan with Kroos meant that Germany missed an aggressive element in midfield. Goretzka would have been better suited further back, and Gomez is a breaker, who lacked the technical abilities to break down a good, but not excellent, Brazilian, defensive line. On top of looking a bit, unbalanced Germany lacked the chemistry needed to break down a disciplined Brazilian side. 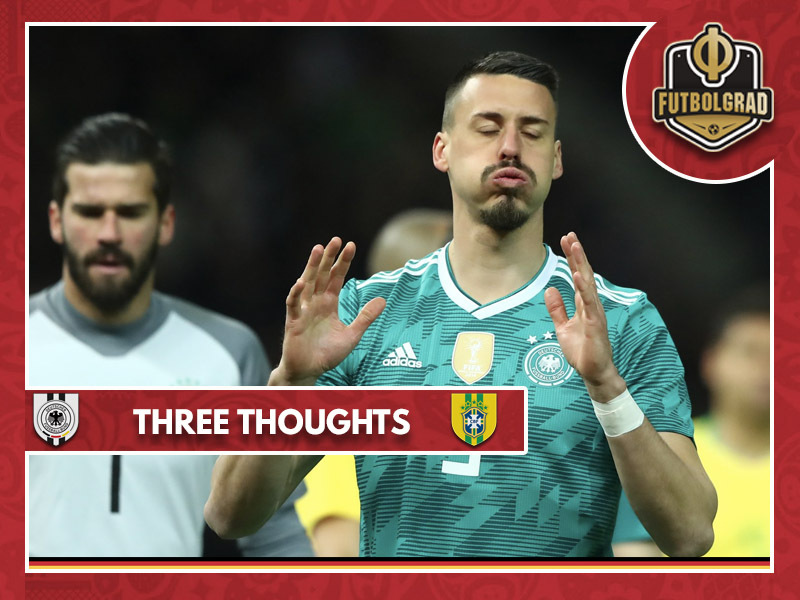 At the same time, one got a sense from watching the match that the Seleção are a beatable side and that Germany with its top eleven in a competitive match would look very different against the Canarinho. The best example was Gabriel Jesus goal that ultimately won the match for the Seleção. Although, not a classical goalkeeping mistake – the ball was headed on goal from a close distance right onto Trapp’s body from where it bounced into the goal – one gets the sense that a keeper with more match praxis would have stopped the ball. With Trapp pretty much frozen out at PSG and little to no chance of making the squad should Manuel Neuer return in time for the World Cup, which looks likely at the moment, the question needs to be asked why Löw opted to start Trapp? It is expected that Bayer Leverkusen’s Bernd Leno will be the third choice keeper behind Neuer and ter Stegen in Russia. Hence the Werkself keeper should have started the match. Ultimately, the decision may have cost Germany a positive result and the chance to make it 23 games without a defeat. Brazil may have beaten the world champion, but Germany was nowhere near its best form and Löw heavily rotated his squad. Tite in the meantime fielded close to his best squad – minus Neymar. The Seleçã0 head coach also made only one switch in the second half in what appeared to be a tactic to protect a tight lead. Hence, although Germany seemed somewhat toothless die Mannschaft had 63% ball possession, and with a bit more tempo and aggressiveness could have broken the Seleção down. 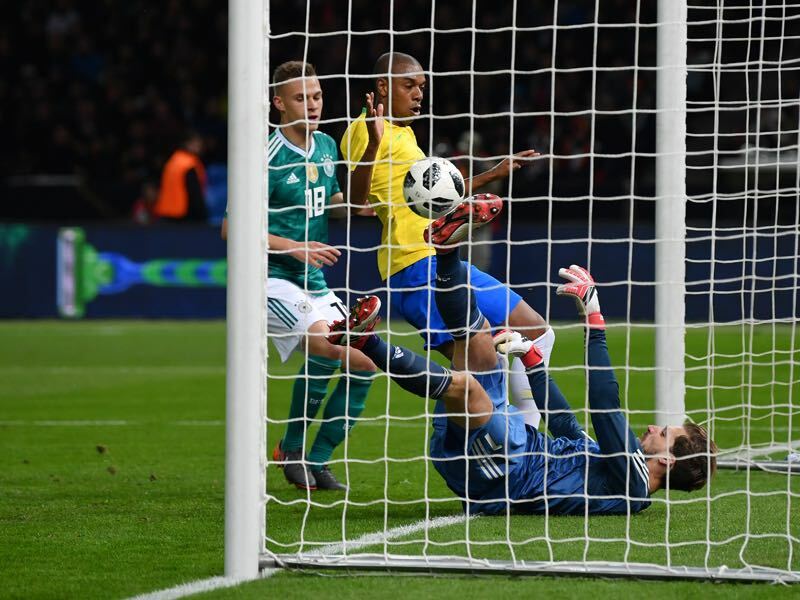 Even in the friendly against Russia Brazil showed weaknesses in the backline and although on paper both results were good for Brazil the Seleção lacks the squad depth and strength in the backline of the likes of Germany, Spain and France.